On his way back from a recent research trip to Thailand, chef Edward Kim of Chicago restaurants Ruxbin and Mott St made a quick stop in Tokyo. He made the most of the few hours he was there with his wife, Jen, by heading straight to the Tokyu Food Show, an incredible food court in the basement of Shibuya Station. On his way back from a recent research trip to Thailand, chef Edward Kim of Chicago restaurants Ruxbin and Mott St made a quick stop in Tokyo. He made the most of the few hours he was there with his wife, Jen, by heading straight to the Tokyu Food Show, an incredible food court in the basement of Shibuya Station. Here, Kim remembers that super-quick, food-packed layover. After taking a train from the airport to the food show, Jen and I rent a couple of lockers to store our bags. With a bit of shoving and some serious elbow grease, we are somehow able to fit our bulky, American-sized luggage into the small, Japanese-sized storage compartments. We walk into Tokyu and see hundreds of food stalls—all within a few hundred yards of one another. There is an abundance of seafood, from whole fish and skipper lobster to super-fresh-looking ready-made sushi and sashimi. The prices range from surprisingly affordable (the sushi and sashimi) to shockingly expensive (pieces of fruit that are individually wrapped, with mundane-looking melons priced at nearly $100). There are rows and rows of thick boiled octopus tentacles that are purple and snow white. There’s beef that is impossibly marbled and looks like baby Swiss cheese with a meat-to-fat ratio of nearly one to one. Jen and I marvel at the delicate pastries and Japanese rice snacks and decide that two lunches within the span of a couple hours is a fantastic idea. 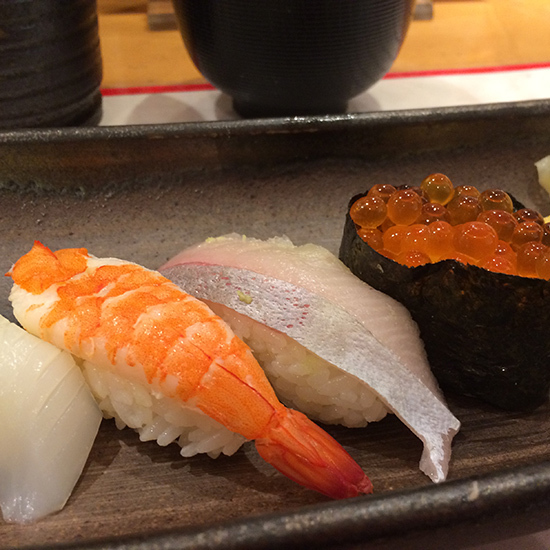 We break away from the food show and have our first lunch—a beautiful selection of nigiri for just $10 each—at a small, charming sushi restaurant located in the basement of the food court. Thirty minutes later, we run to the ninth floor for a second lunch of crispy shrimp tempura, sashimi and cold noodles, similarly priced. Near comatose from overeating and running around, we somehow manage to get back to our luggage and catch an express train to Narita Airport. Checking in our baggage, getting to the gate, it all seems like a blur. As we sit in our seats, Jen and I let out a sigh of relief. We're sad that our trip is over but happy to head back home (and relieved we can finally pass out). It's about 16 hours to Chicago.